HAVE CHECKED AND THIS SEEMS TO BE A GOOGLE PROBLEM. I WENT OVER TO THE NEW INTERFACE THIS MORNING BUT HAVE SWITCHED TO THE OLD FOR NOW. FINGERS CROSSED ITS DONE THE TRICK. 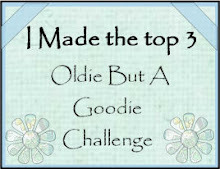 Well I cant remember the last time I made a card for a challenge of my choice. 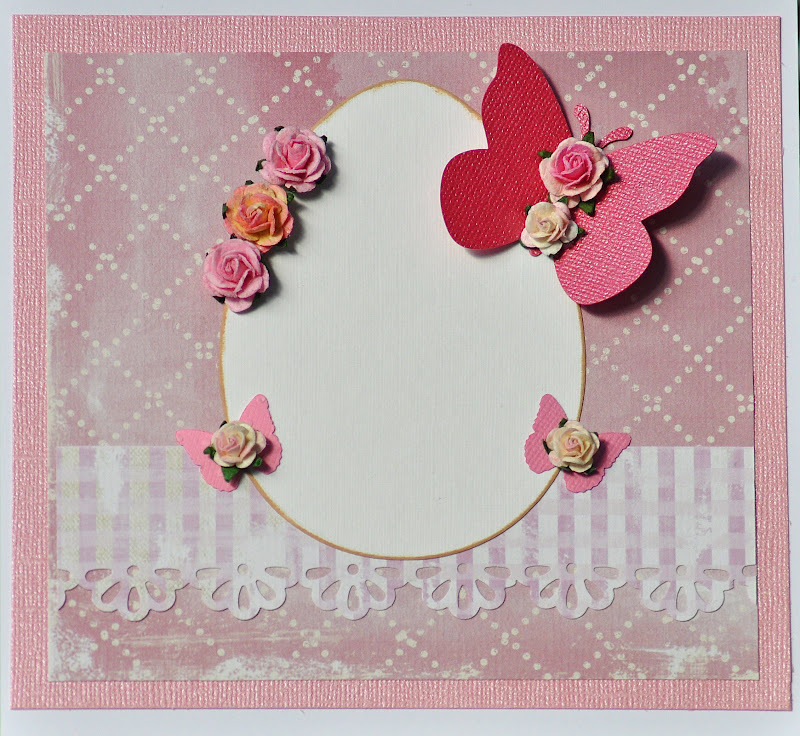 Normally I make the card then see what fits but I loved this weeks Papertake Weekly Challenge so this was made using this weeks sketch. I'm lovin my Tilda's and I've inked this one up for the second time, if it makes a third it will be a record!! 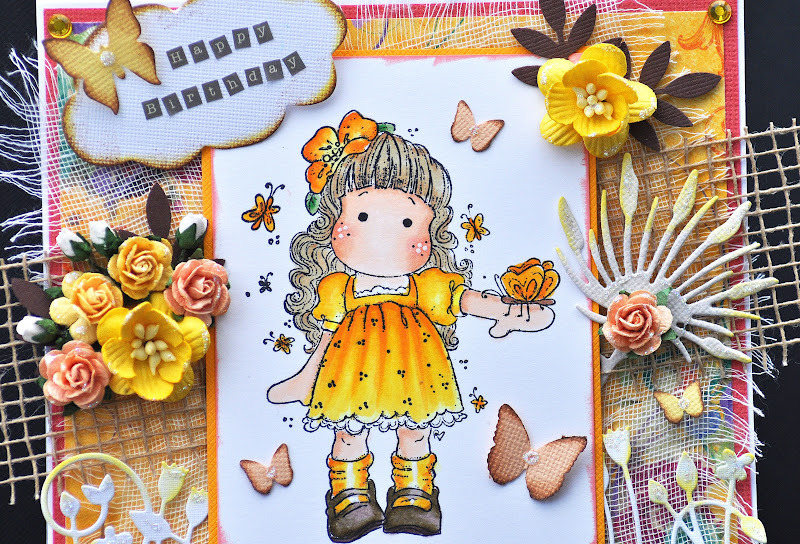 She's been coloured with Copics and I've used the beautiful papers from Bo Bunny's "Country Garden Collection". Lots of Dies and Flowers all covered with Stickles as usual. A piece of Lace and a Button with a piece of String that was off a clothes tag. This may be my last card for a couple of weeks. 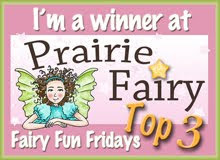 Were off to Center Parcs during half term and I dont know if I will get any craft time before we go. I was hoping this gorgeous weather was going to continue but I think its on a downward spiral. As long as its not to wet and Center Parcs has lots of activities whatever the weather so I'm sure we will enjoy ourselves. I know I will be passing by some of your blogs before I go and I'm going to see if I can sneak my Copic Holdall in the car, would it pass for a suitcase - lol!!!!! Hello everyone, its been a beautiful day here in Kent and I had the tough decision as to zap the house or sit and craft. Of course I chose crafting, so much more fun! This is Neveah from Saturated Canary. I dont normally do digi's but am going to give them a go. She has been coloured with Copics. I've listed the colours used at the bottom of the post. She's totally gorgeous and her face is so sweet, love those big eyes. 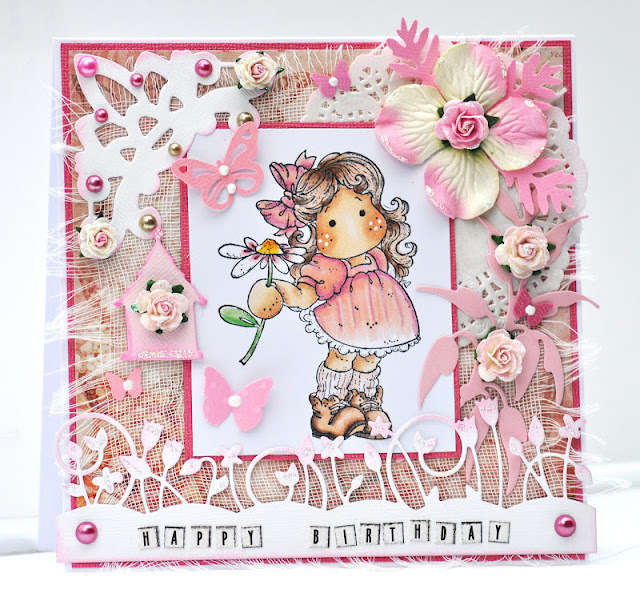 Backing paper from "Pretty in Pink" Glitz Paper Pad, Cheescloth, Stickles, lots of Dies, Punches and Pretty Flowers. Thanks for stopping by my blog today, I really appreciate it! Hello everyone, cant believe another week has gone. Time really does get the better of me sometimes. But I here again with yet another Tilda card. Think I've got a bit of a thing for her right now as all I've done in my spare time is colour her up. So spring is looming and I love looking at the daff s sprouting up in the field. So I have gone with spring colours and made a Birthday Card. I can honestly say I have never used these colours before so colouring the stamp was alotta fun! Another make it up as I go along. Best way for me. Cheesecloth (as ever), pretty Spring Border Die, Cloud Die, Punches, Jute Ribbon, Stickles and Gems to make this pretty Spring Card. Now I've taken 2 piccies. One with a dark background and one more in the light. Couldn't decide what looked best so posted both. And below is a close up of whats on the card. Dont usually do photo heavy posts but this is so pretty IRL. Sold lots of stash on ebay. Adding everyday. I've got more than I will ever use and at least another 30/40 stamps to go on. Usually update in the evenings if your interested. Thats it from me today, chores have been neglected so will have a made rush about 1hr before hubby gets home. Done the basics but I want to browse and see what you've all been up to. Thanks to the lovely Frea, Kate, Clare & Judy. I promise to follow the rules and post this on my blog soon. Need some help with ebay. I see lots of peeps add piccies to there description. Been faffing around of an hr now and still cant fathom it out. Got my photobucket up and running again, can see I need the html code under picture but lost from there. can anyone help me. 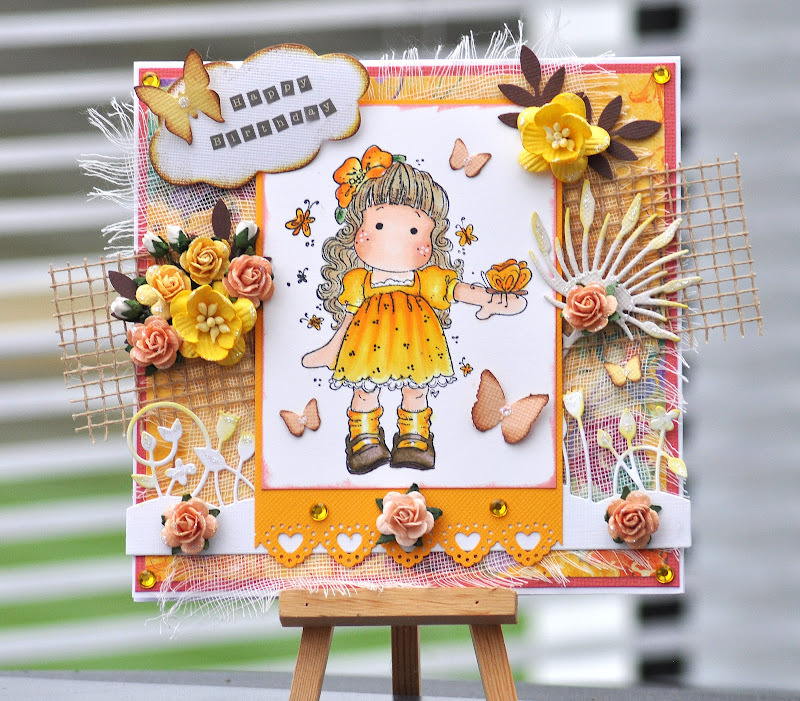 Hello everyone, yep I managed to have a crafty session this morning playing with this gorgeous new stamp and defo one of my favourites. Say I managed. Hubby is away for a few days so I thought I'd have a me day and worry about the chores tomorrow before he comes home. So back to my card. Tilda has been coloured with Copics, Cheesecloth which I cant live without right now. 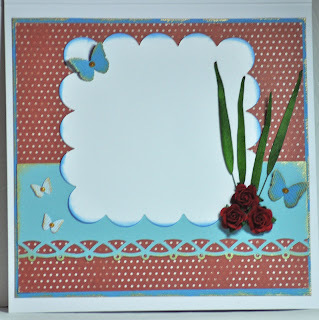 Gorgeous Spring Border Die and a few others. Flowers, Stickles, and pretty pearls to finish. I just love the tiny stickers, thought I'd go with a Birthday Theme for a change. Thankyou to all who have been biding on my ebays items listed. Believe me there is so much more. I do have way too much stash and alot never gets inked up. Some of the stamps are no longer available. I've still tons to add so keep your eyes peeled. 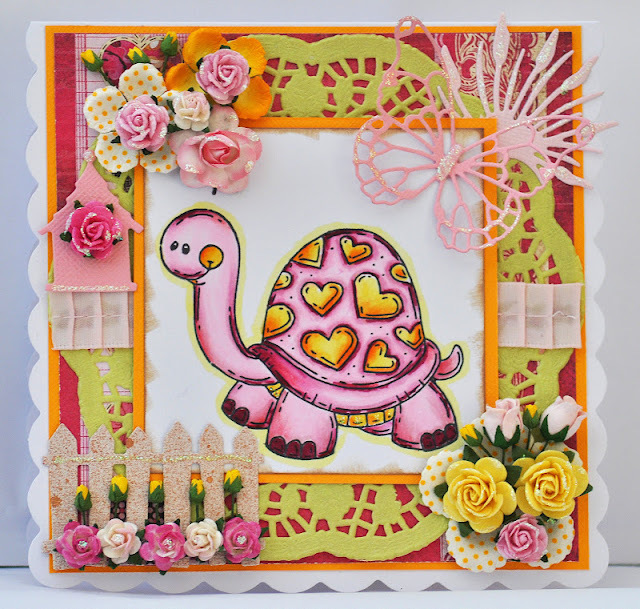 Magnolia Topper - OTT!! Comment problem fixed.......,..
Hello everyone, today I'm showing my first ever topper and I think I went a bit mad, even my dining table wasn't big enough to cater for the amount of stash I got out to make this up!!! I've used Tilda with Bow and coloured her with Copics. 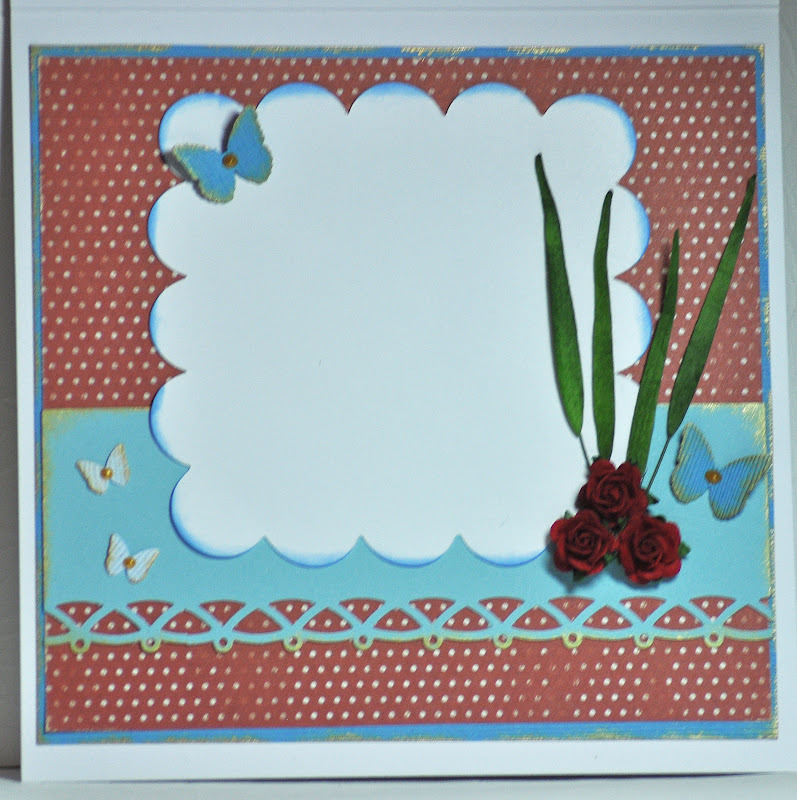 The paper is from the Prima Meadow Lark Pad, with Cheescloth ontop. I got the Elegant Edges Cartridge for my new Cricut yesterday and wow its fabulous, will also make wonderful shaped inserts. I've used of the it to extend my topper. 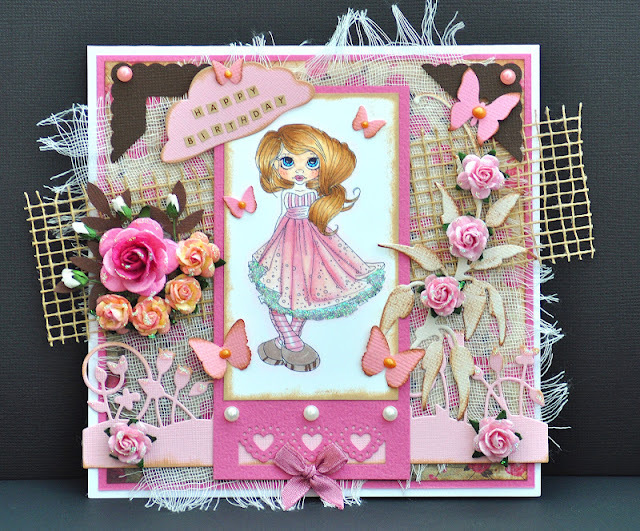 Embellishment overload on this one using lots of different dies, flowers, punched butterflies and a small doily I bought the other day. I last week decided to step down from my DT's. It wasn't an easy decision at all and I still have regrets, but crafting was being more of a chore than a hobby and I want to be able to have the time to work at my own pace hopefully with even better creations. Cant guarantee all the time but I'll try. 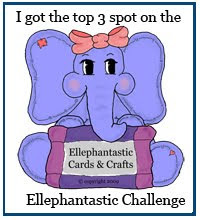 lol I've had a good old nose round blogland and gots lots of inspiration so hopefully my mojo will keep. Maybe because spring is looming and I feel so much perkier. 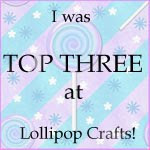 So maybe one day I'll go back to some DT's, but for the moment I'm happy being mum first and crafter second. Thanks for looking, have a lovely weekend and hopefully find some time for more crafting very soon. This has been added to my Ebay Shop. Hello everyone, back with a card using one of my favourite stamps "Daisy" from SN. She's been coloured with Copics, papers are the new " My Minds Eye, Everyday Flair" Pad. I'm going to try and be a bit more organised and list the pens and stash used. Even useful for myself at times, so will be listed at the end of the post. Well its taken me well over a week to make this card but here I am at long last and with a card that I am very happy with. I've a draw of Magnolia stamps that never see daylight. I've been having a good sort out in my craftroom and have added lots on ebay and still loads more to go on if anyones interested. I went totally OTT with this card and love the final result. Tildas been coloured with Copics and Prismas and dotted around her with a White Gel Pen. The papers are Magnolia, Dies Galore including my TH Weathered Clock, a big favourite right now. 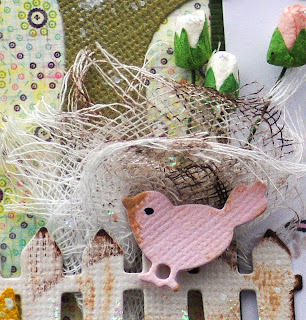 Found all my flowersoft in a cupboard so have added to the Magnolia Fence along with lots of MS Punched Butterflies. Cheesecloth, Stickles and a Viva Pearl Pen for a touch of detail and a scrummy piece of lace to. Forgot to say the tag on the left is removal so you can always add a message there to and the fence has been arched giving a bit of dimension. This is the inside. Again Magnolia Papers, Flowers, Punched Butterfly, MS Border Punch backed onto Bazzill Cardstock. Thats it from me, busy week ahead, Jessica is off to Budapest in the morning. Gotta be up at 3am - eek. 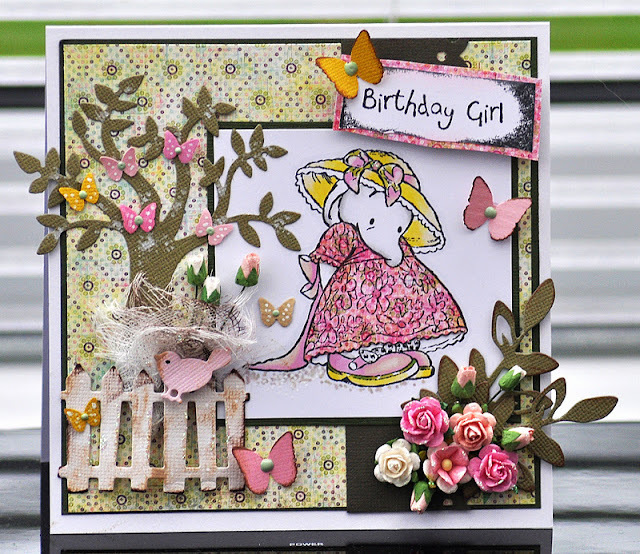 Will be catching up with blogs throughout the week and hope its not too long before I'm back with another card. Been looking at this Copic Storage Bag for a while and yesterday I caved, though I dont regret it for one moment. I had all my copics (and theres over 300) in 2 Clear Storage Boxes and a draw. Says it stores 380 bet I think I could sqeeze a few more. Wendy at The Glitterpot gave a fab service. Ordered yesterday and received by courier this morning. Was going to sort the kids rooms before Jessica gets back from her trip to Budapest and Daniel back from Boarding School today, but think I will label all my Ciao's so I can see them all clearly, then maybe have a colouring session. Back soon and I've added more bits to my Ebay Store. 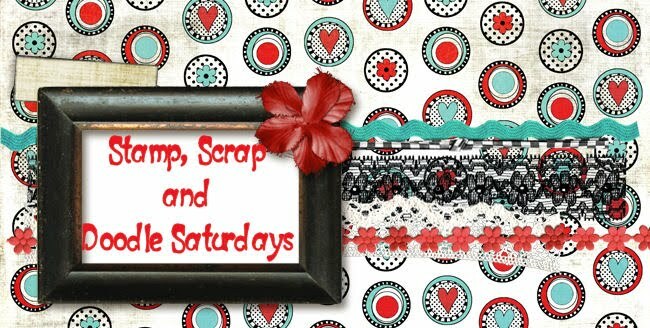 The craftroom cleanup continues! Hello everyone, sorry its been so long. Had no time for crafting and I dont even have a reason. Thats families for you aye!! 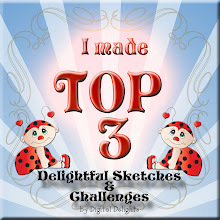 Today we see a new challenge over at the CES Challenge blog and I was raring to go. 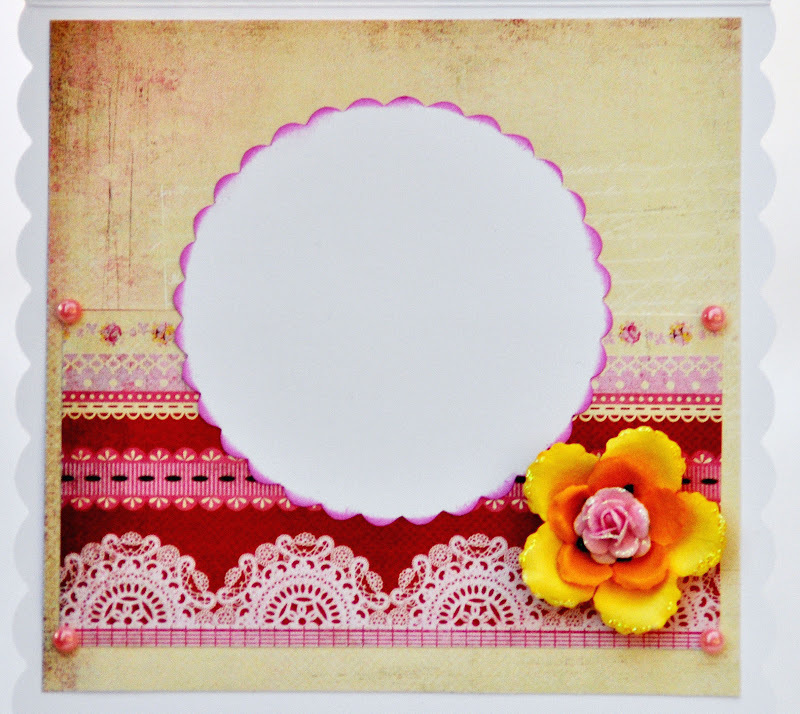 Love using layers and of course lots of pretty flowers. I had so much fun making this card up. 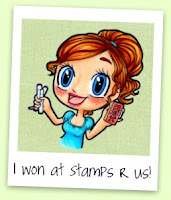 The stamp is the adorable "Lovin Turtle" from Whimsy Stamps and has been coloured with Copics. 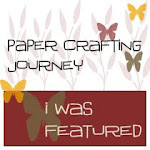 The papers are Basic Grey - Kissing Booth and have used Yellow Bazzill and a Doily from Crafty Emma's Store but I dont think she stocks them anymore but there is lots of yummy papers on pre-order with 20% off so go take a look. Also used an array of beautiful Dies, lots of Stickles and a piece of ribbon. 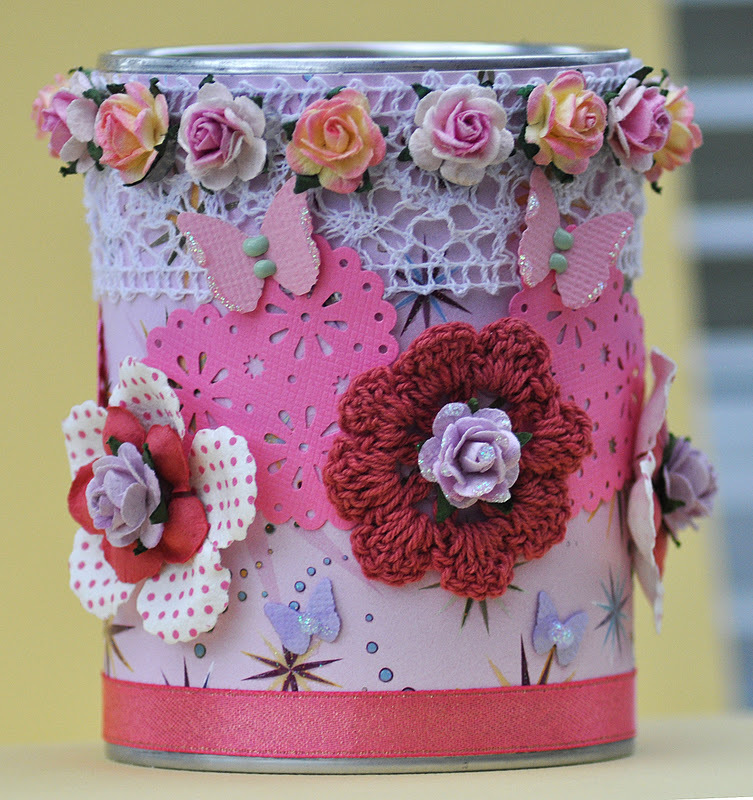 As you can see below I have decorated the inside using the same papers and flowers. So check out what gorgeous creations the rest of my teamies have made. The kids are now on half term and I'm determined to make a few cards. Heres a list of challenges. So lets see those plaid or gingham papers on your cards/projects. Now my card turned out nothing how I planned and I am so happy with the final result. I'm not one for skeches and like to see how things lay on the card. 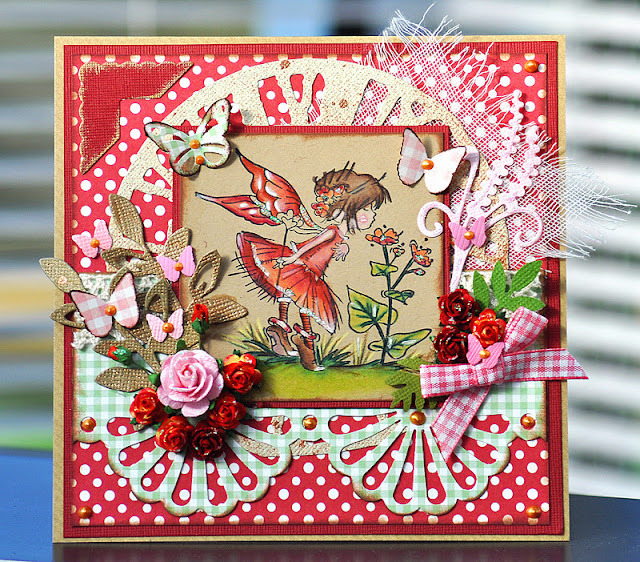 This has to be one of my favourite stamps "Fairies On Tiptoe" from LOTV. The cardstock is Kraft.The dotty paper is a piece of scrap and the gingham is Craft Creation. Used the gorgeous wide MS Border Punch an edged all papers with a Brown Chalk Ink Pad. This is my third attempt colouring on Kraft. The first was just pencils, 2nd copics and this has been done with pencils blended with Sansador, defo my favourite so far. Lace, Viva Pearl Pen, Cheesecloth, Stickles, Gold Ink dabber, Copper Glimmer Mist, Gingham Bow, MS Butterfly Punches, lots of flowers and dies including my new TH Clock die. I have for a first also decorated the inside of the card but silly me forgot to photograph it - doh! So lets see you get your gingham out and enter this weeks CES Challenge where you can win a £10 voucher to be spent in Crafty Emma's Store, theres lots of goodies in the sale to! Hello again, hope its not too cold or windy where you are. A great excuse to stay indoors and do some crafting, or so I thought. My Zoe woke with a sore throat and headache. Now cant hold down any food or water and has slept on and off most of the day. She also has a temperature of 102, so guess who wont be at school tomorrow and I have to be up at 6am to get Daniel off to school. Think matchstix will be needed tonight -eek. Between her and the dog, I've had a right old week lol. Now I must confess I'd totally forgotten about these stamps. I have a draw full of them, so thought it was about time I put at least one of them to use. 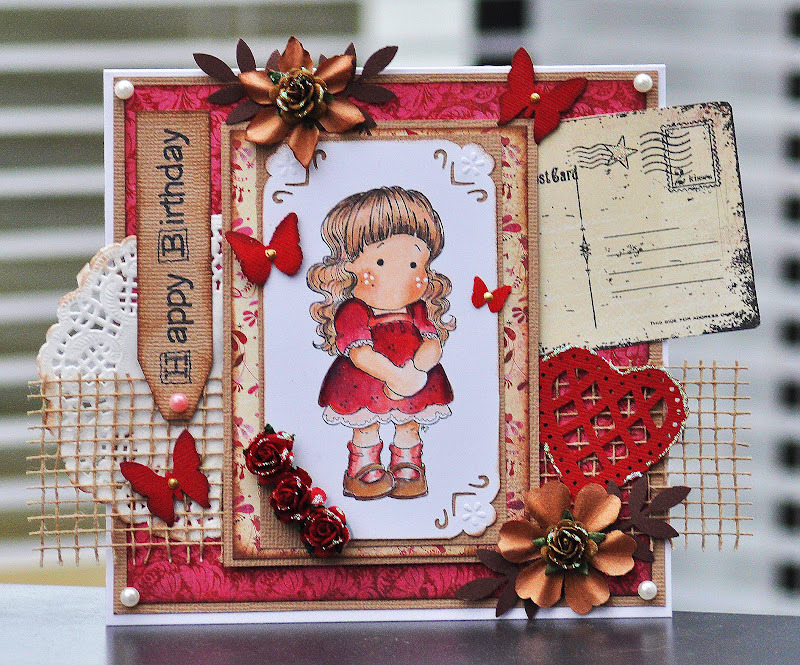 This is "Humphreys Corner Birthday Girl" from Crafters Companion . Her dress has been paper pieced and the rest coloured with Promarkers. I have so many dies that I just dont use, so got my bigshot out and had a cutting session, then yesterday tidied and resorted my craftroom. A bit more organised, well for the moment anyway. Do you like my little birdnest?? I was fumbing with a bit if cheesecloth at the time, couldn't decide where to put it and this is what I came up with. Frayed the edges and rubbed over with a chalk ink pad. 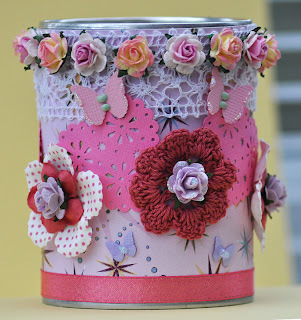 The papers used are Basic Grey Sweet Thread, other items are Crystal Stickles, Viva Pearl Pen, White Souffle Pen and lots of various flowers, punches and dies. Well thats enough of my waffle today. We's love to see you over at the Dream Valley Challenge and this weeks prize is a Surprise Parcel. Heres a few challenges and I hope you like my card as much as I do. 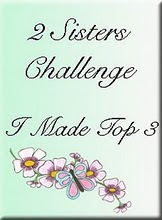 And I've just made the Top 3 for my fairy card 2 posts down!! 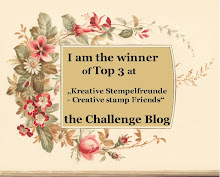 Good morning everyone, its finally the weekend and another new challenge over at the CES Challenge blog. Thanks to everyone who played along last week, some fab entries. This weeks challenge is anything but a card. Eek, not often I come out of my comfort zone but I saved this coffee powder tin wondering if I'd ever get round to altering it and hey presto! I've been reading how so many are going to use old stash and unused items. The paper and bazzill are from my scrap draw, so I've made a start. This really was a make it up as you go along jobs but I think its really pretty. Jessica my 16yr old really liked it and she's not into girly things so I've given it to for her nik-naks. Thats it from me today. Thanks for stopping and enjoy the rest of your week! PS: Darcy our labrador is alot better now, tablets doing the trick! Good morning everyone, I've been a nawty blogger this last week and am finally back with a card for this weeks Lili's Little Fairies Challenge. 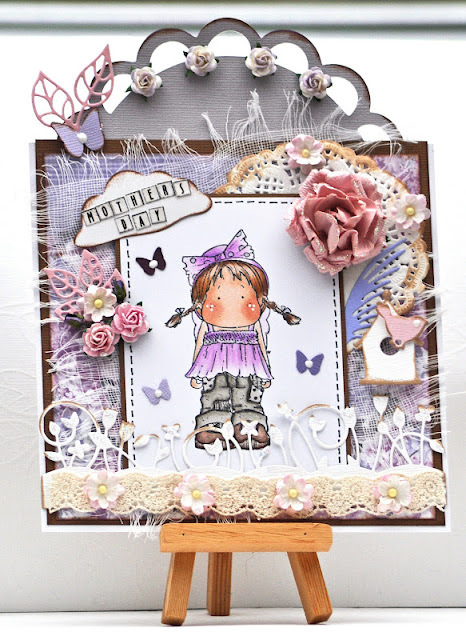 I love this weeks theme "Lavender and Lace". Think these colours are always so pretty on a card, I should make a note to use them more often. I have used tiptoe fairy and again coloured onto kraft, this time with Copics and Promarkers. (I'm experimenting I think). The papers are a mix of Basic Grey Koishi and Wisteria. You cant see the card blank but it is a beautifully embossed pearl and so pretty. 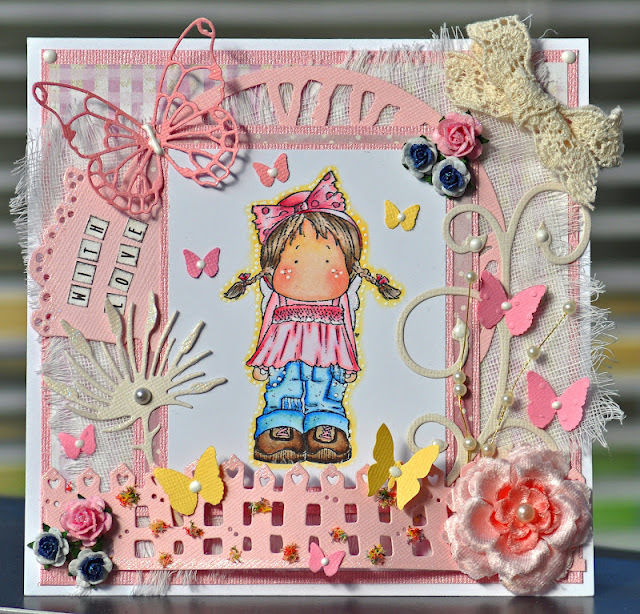 Lots of sparkle and punches used and a Cream Viva Pearl Pen on the butterflies along with a piece of lace and the LOTV postcard stamp. And I really must tidy my craftroom, (again). All of my 6x6's have fallen of the shelf and are scattered over the floor atm, and everything else is just a mess. Could have sworn I had a good sort out before christmas. lol. Never mind, maybe I'll get to make a sneaky card whilst I'm doing it and I need to make room for new stash on order. Didnt bother to make it a new years resolution as I new it wouldn't last. 2 weeks it pretty good though dont you think - hehe. I'm having a day indoors so if I stay awake I'm gonna have an hrs "me time" and catch up with your blogs. Enjoy the rest of your week and thanks for stopping by today.